Oil deodorization is the final stage in an edible oil refinery. It creates a more bland oil by removing odiferous material and other minor undesired particles, in turn increasing its shelf life. It is commonly used in the process of refining palm oil. In oil deodorization, the bleached oil is first deaerated then heated. It is then deodorized by using high pressure steam. KMEC's deodorizers employ a combined methodology. The upper part is used to remove free fatty acids while the bottom part works for consistent quality. Oil from the deodorizer is cooled and stored after passing through the heat exchanger. The free fatty acids are collected and stored as by-products. Palm oil is one of the most widely consumed edible oils in the world today. Palm oil is obtained from the flesh of the palm fruit. Each palm tree produces approximately one fruit bunch, containing as many as 3000 fruitlets, per month. In addition, each palm tree continues producing fruit economically for up to 25 years. This ensures a constant stable supply, as compared with other annual crops. Naturally, palm oil is characterized as stabilized oil due to its chemical composition. Palm oils consist mainly of glycerides and, like other oils in their crude form, small and variable portions of non-glyceride components as well. In order to render the oils to an edible form, some of these non-glycerides need to be either removed or reduced to acceptable levels. The aim of refining is therefore to convert the crude oil to quality edible oil by removing objectionable impurities to the desired levels in the most efficient manner. This also means that, where possible, losses in the desirable component are kept minimal. The palm oil refining process is quite identical. There are two routes are taken to process crude oil into refined oil; which are chemical (basic) refining and physical refining. The methods differ basically in the way the fatty acids are removed from the oil. 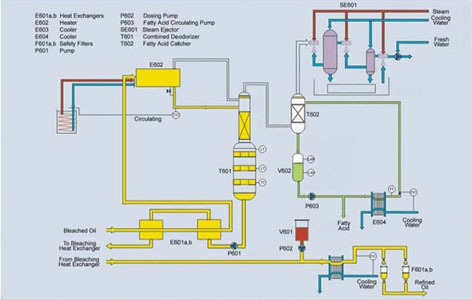 Physical refining, which eliminates the need for an effluent plant for the soap stock, involves subjecting the oil to steam distillation under higher temperature and vacuum for removal of the free fatty acids. The physical refining is used to remove the free fatty acids. The refining of physical plant is practiced to subject the oil to steam distillation.